Three 2014 LRNG Innovators Challenge grantees share how their work has progressed, relaying both tremendous successes and ongoing challenges. Since we last checked in with Liberty Elementary, a 2014 LRNG Innovator Challenge grant recipient, the garden project has grown, now reaching all the way to the 6th grade. Exciting and notable volunteer support for the program means that the available offerings for ageless, gradeless passion projects has grown tremendously. Parent volunteer Janet Aydelott, for instance, incorporates botany concepts into the students’ time in the garden, leaving them with a strong impression of what a career in research science could be like. The multiplying list of passion project spaces include Garden Club- 3rd-6th grade (large garden), Garden Club- Kinder-2nd grade (small garden), Lego Education, Circuits, Podcasting, Video Production, Newspaper Club (journalism), Digital Storytelling, Origami, Chess Club, and Augmented Reality, all of which exist within the school and are open to all students. 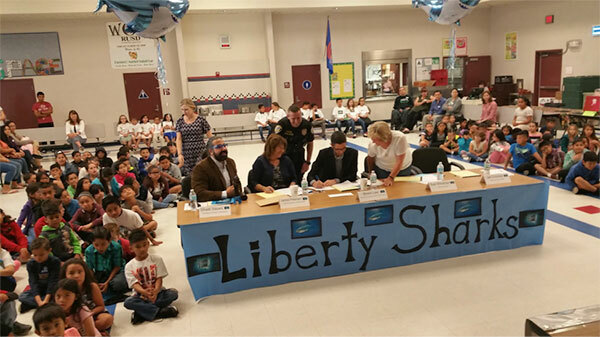 Building on this atmosphere of creativity and inventiveness, the school has embraced a new forum to showcase student learning: the Liberty Elementary Shark Tank. The Shark Tank concept evolves from the popular television show, where entrepreneurs pitch their innovative ideas to investors. At Liberty Elementary, student groups from the various passion projects spaces present their work, demonstrating the unique products of their own imaginations, and the tools and opportunities available in their spaces. The winner of the first Liberty Elementary Shark Tank: a group of students creating an awe-inspiring augmented reality joke book for a classmate who was hospitalized at the time. Since 2014 the momentum of these diverse, innovative, and community-supported passion project spaces has only grown, and looks set to carry forward into the coming school-year and beyond. At JH Rose High School in Greenville, NC, students participate in an 80 minute SMART Block lunch period, giving them time to eat, make up tests, get tutoring, or participate in club activities. In 2014, a group of teachers connected with the Tar River Writing Project received an LRNG Innovators Challenge award for Pop-Up And Make, which aimed to create opportunities for students to engage in interest-driven learning, tinkering, and making during this time. According to Rob Puckett, one of the project’s leaders, it has been a success. In the UpCycle Makerspace, students are able to take donated materials and repurpose them into useful furniture for outside school use. One female student is using the 3D printing system to fabricate a prosthetic hand, fulfilling a state-mandated senior capstone project. Puckett remains impressed at the number of girls who have been engaging with the 3D print and modeling makerspace, cutting against stereotypes that assume a disconnect between girls and STEM. Parents and community members are also excited about these programs: the Pop-Up and Make team has been able to meet maintenance costs and acquire additional supplies, thanks to support from the school’s academic booster program. As with all good things there remain challenges in defining sustainable roles and commitments for participants. 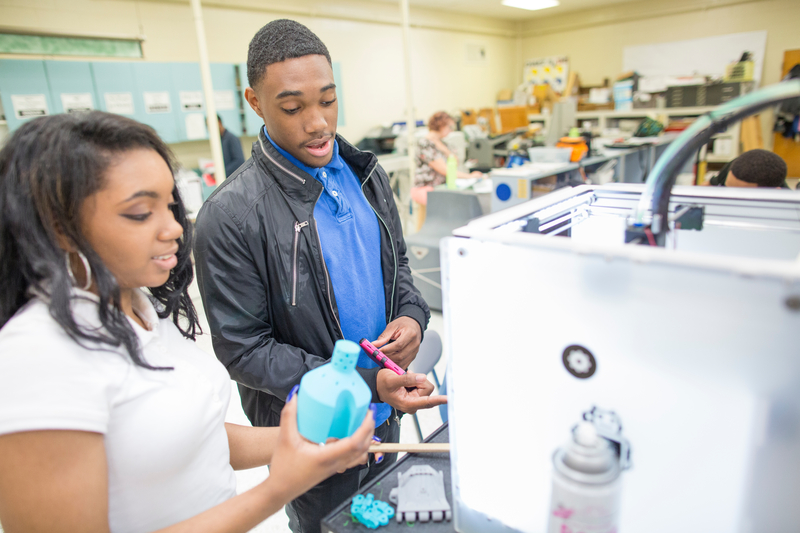 Adapting to the challenges over time, the team chose to focus on having three teacher-supported makerspaces, with a rotation coming in the middle of the school year. One challenge that still stands out: bus transportation. In this non-urban environment, students travel on bus as much as 30 minutes to get to school. Without flexibility in transportation, opportunities for afterschool participation in maker programs can be limited. The Pop-Up and Make team aims to continue to build community partnerships as they address these challenges and continue to grow their network of youth makerspaces. The Youth Participatory Action Research (YPAR) project at Castle Hill Middle School in the Bronx, New York City has become its own course, and expanded to two days a week from the original one. An LRNG Innovators Challenge grantee in 2014, YPAR at Castle Hill remains focused above all on the process, giving students the opportunity to reflect on real issues in their school and community, and to take real action to address toxic policies and consequences, as a means to pursue collective healing. The grant was able to fund a set of Chromebooks, which set the school on a course to now have three available laptop carts per grade, making internet-based research a staple for students as teachers revisit ways to integrate these devices into lesson design. Enrichment trips, also first funded through the LRNG project, have now become an annual program. Students traveled to Washington, DC to visit Howard University and learn more about the legislature and the work of the federal government. Middle school students from Castle Hill Middle School in the Bronx share their research projects with New York State senator Jeffrey Klein. What’s on the horizon at Castle Hill? Filipiak and Sanders offer that there’s still work to interweave YPAR processes further into the fabric of the school, apprenticing more teachers while reaching across the disciplines. Sanders continues to find hope through the process, and with starting a new extracurricular book club with his students, sees new energizing avenues for co-created opportunity and community impact. Read more about Castle Hill’s YPAR initiative through this resource at Writers Who Care.